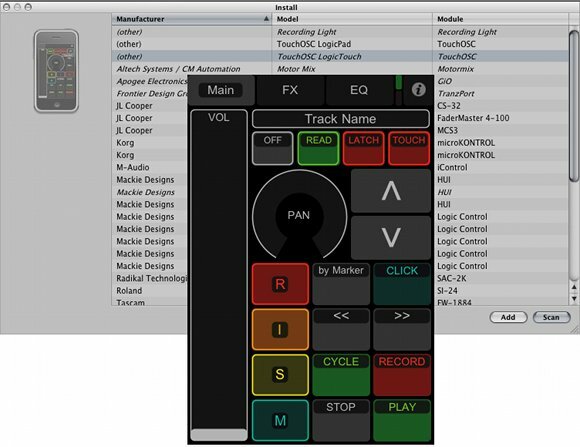 If you’ve wished you could use your iPhone, iPod touch, or iPad as a remote control for Logic, now’s your chance. And touch control continues to evolve as an additional option for manipulating music software, alongside good, old-fashioned knobs and faders. Handheld wireless touch control is certainly coming into the mainstream. As we see new controller integration in tools ranging from Ardour to Renoise, Apple quietly added support for iOS touch control in an update to Logic. Supports iOS control surface apps that utilize the OSC protocol. Control Logic using your iOS device – Officially. Basically, select the awesome TouchOSC app and your device under Control Surfaces, and automagically unlock access to mixing controls and automation. It’s nothing revolutionary, but these devices make perfect remote controls. It’s also nice to see this kind of control as something that’s evolving independent from individual apps. That is, instead of having to buy an app for each software you own, just as with MIDI, there’s some interoperability. It seems to me that the next logical step is to begin to introduce some standardization to the way in which DAWs and touch controllers interact. But before we get there, this kind of solution is a good place to start; I think without playing with this stuff, it’s hard to know what a “standard” of some kind (lowercase “s”) would look like. Speaking of playing, let us know how this works for you. Thanks, Sam, for working this out!